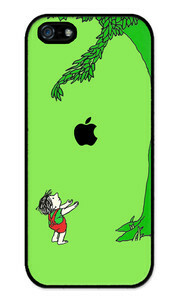 Every year I read one of my favorite stories of all time, The Giving Tree by Shel Silverstein. I’m sure you all know the story and if you don’t, please do yourself a favor, click on the link and just buy it. You won’t be sorry. I even bought myself the phone case for my birthday last year. Anyway, my partner teacher and I wanted to create some sort of assignment with this book. This is what we came up with and I love it. After reading the story the students each reflect on their own life and determine who is their giving tree. I have them write on a post-it (obviously, I have a post-it problem) who their giving tree is and the reasons why. I also explain that the reason has to be something deeper than…”My mom is my giving tree because she buys me stuff.”–Unacceptable. The students are trying to make a real and meaningful text to self connection at this point. 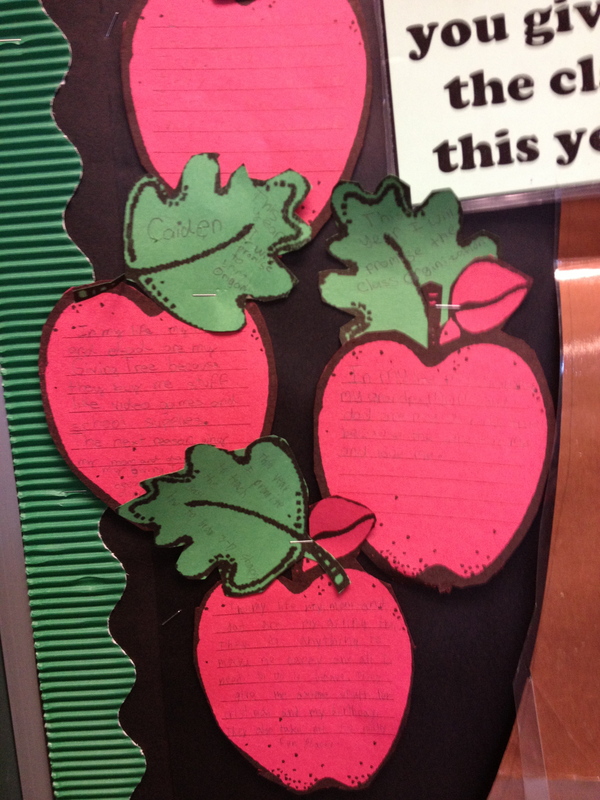 After I correct the post-it for conventions, each student is given a red apple. (Apologize for not have it here for you to download, but it’s on my work computer. So sorry.) It’s basically just an image of an apple blown up and we inserted lines over the image. I copy of red construction paper because I don’t like to spend time coloring in class, but you could just have them color it red if you so choose. Then, each student is given a green leaf. On this paper, they are to reflect and decide what they are going to give to the class this year and it CANNOT be any material thing i.e. school supplies. I post these up the whole year and revisit them so I warn the students to chose something that they are truly planning on sharing with the class. My students came up with some awesome ideas of what they are going to share this year: teaching origami, how to throw a football, kindness, teach organization, etc. 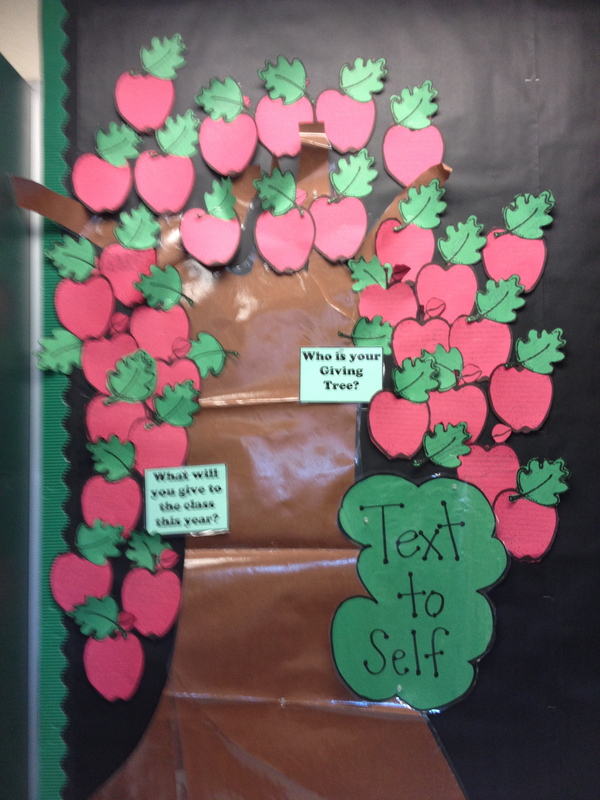 On back to school night, parents can find their child’s apple and so many are filled with joy to see what the students said about their giving tree. I LOVE this activity. Click on the above link for his Giving Tree read aloud. Okay, so I guess I have time for one more. Thanks to this post which contains an amazing list of different team building challenges, I did this activity for the second year in a row this week. The kids, of course, loved it. 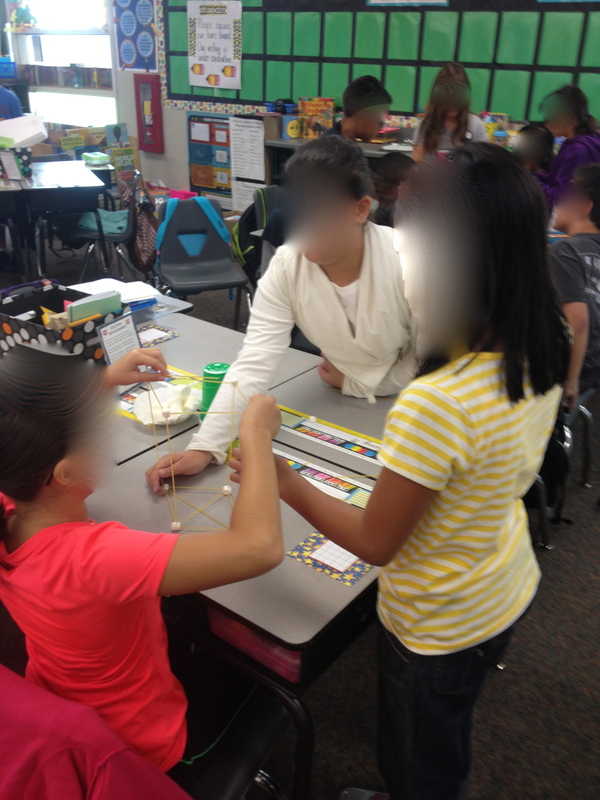 This team built the tallest structure that remained standing on its own! 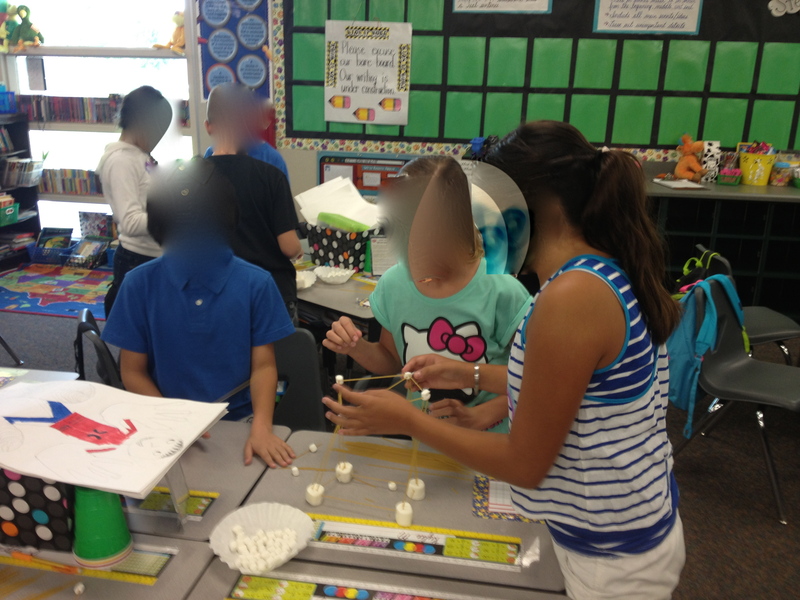 This team tried so many different structures! 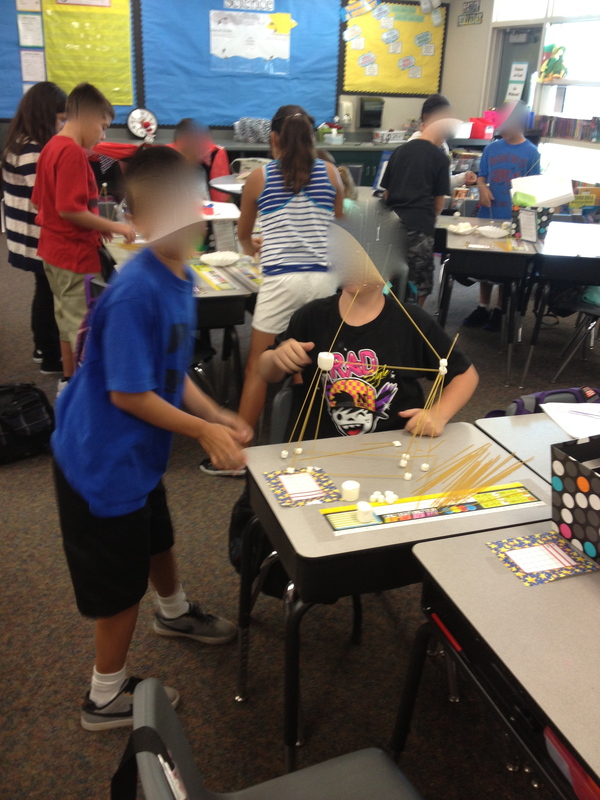 The teams were challenged to build the tallest structure using the noodles and marshmallows–nothing else. Click on this link to my pinterest board. It will take you to the top post where you can print out her list of different challenges to try each week! The first month of school, I try to complete one challenge a week. 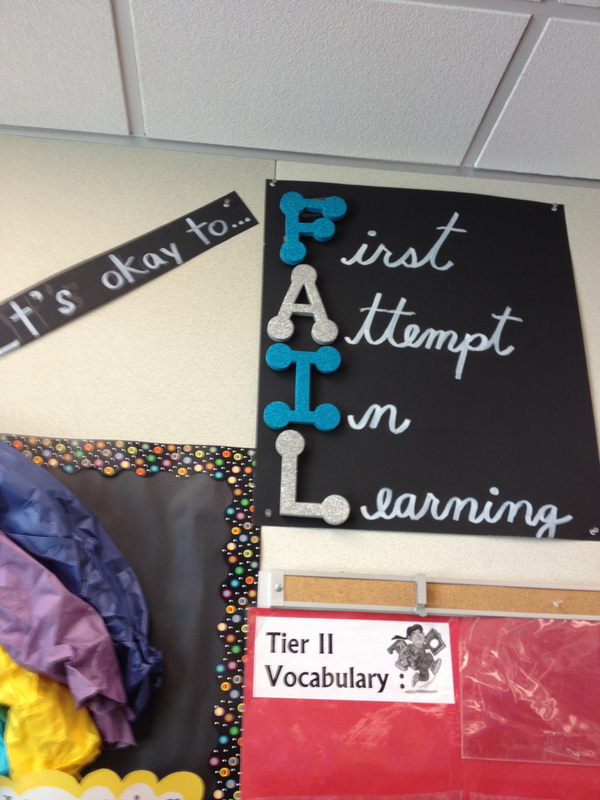 I’m truly trying to teach the kids never to give up and it’s OKAY TO FAIL!!! See the sign I made (can’t believe I actually made it–so super easy. I love the paint pen!). Bought the letters and paint pen at Target, glued it all own and voila! The kids were so scared at first glance, but calmed down after I explained. Next sign needed…. Mistakes are proof you’re trying!